Supplemental Figure 1. Determination of RNA integrity via gel electrophoresis. (A) RNA with high integrity used for further analyses: to clear bands for the 25S and 18S rRNA, with the upper band being twice as strong as the lower one. 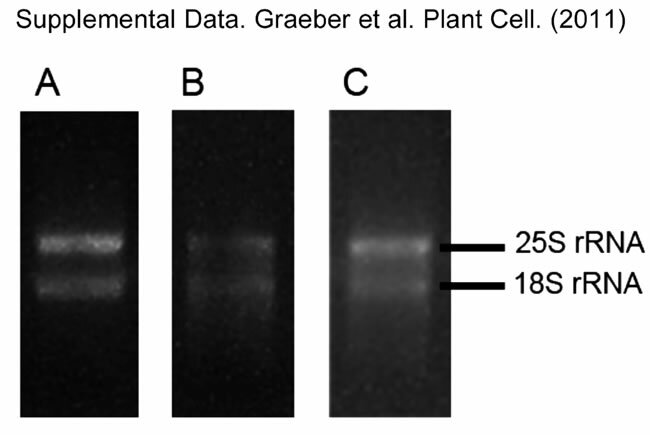 (B) and (C) RNA with low integrity, which was not further used: showing either not the 2:1 ratio in band intensity between the 25S and the 18S rRNA (B) or showing RNA degradation indicated by a smear on the gel (C). Between 100 and 200ng RNA were loaded on a 1% agarose gel.